Our young people are moving with the times where the presence of technology is ever so strong and continues to change. Classroom teachers are finding new and innovative ways to use technology to engage their students in a progressive way. 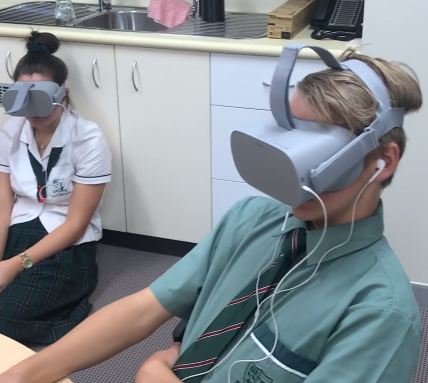 Mr Breck Nielsen is the Trade Training Centre Director at St Mary’s Catholic College in Woree, and he has introduced the use of virtual reality to the school’s year 11 students studying the Diploma of Business. This has grown their class from a group of students in a room on campus, to a classroom of many locations shared with other students and teachers around the nation. The technology allows the students to be teleported into their Diploma of Business class, where their Trainer is waiting for them and the balance of their classmates from around the country join in too. The Trainer chooses a classroom space for each lesson which may change from a boardroom, to a lecture theatre, and even to outer space! Mr Nielsen discovered this novel approach to learning for the school. 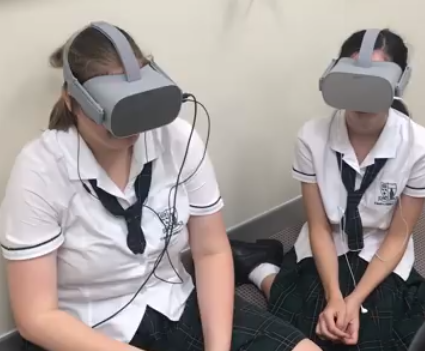 A Queensland company, Redmako Learning has been engaged to supply the Business training course, including the provision of the virtual headsets and software. “We wanted to bring quality training into the classroom without having to employ a full-time trainer,” said Mr Nielsen. Some of the students plan to further their studies at university in the Business field. They are acknowledging the link between the virtual technology experience and their future careers. The opportunity to make connections to industry professionals and peers direct from the classroom will give the students confidence and networks to help progress their interests in the real world. This is the first year that the school has partnered with Redmako. Year 11s are the group who have had the opportunity, and they will continue into year 12 in the same certificate. The students are saying that it’s great being part of this new and innovative learning experience.